Watch Me Lose It-For Real this time. : So you say it's Hump Day. So you say it's Hump Day. Well my second first day with J was crazy nuts! 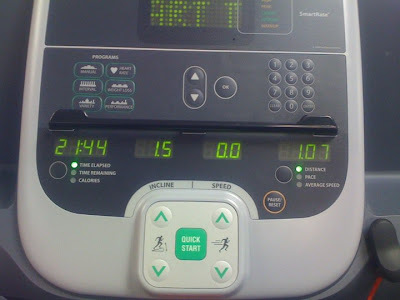 I walked a mile on the treadmill before he got there ( I am thinking I was DONE after that). When he got there it was lower body. Holy Batman! I have like ZERO core strength what so ever. Which you need a TON of to do lunges and squats etc. It was hard. Everything was hard. I really did like one part, where I was kicking the living crap out of one of those balance balls. By the time I was to the end of that part I was literately grunting giving it all I had. It felt amazing. I did notice that I have more strength on my right side than I do on my left side. I could kick harder, run harder, everything harder on the right side. When it was time to switch it up it was like wussy kicks. I don't know what the deal is with that. By the end of my session my legs were like spaghetti noodles. I had to sit and chill and catch up with K before I could walk to my truck! But nothing can explain the feeling I get when I lay in bed after working out like that. I feel like for the first time I am doing something RIGHT. Tonight we meet again. It is upper body this time. Bye-Bye bat wings! Last night I tried for the second night to complete the Week 1. Day 1 of the Couch to 5K program. I tried last week, but I had a crappy pod cast and the music bored me to tears (and I got a freaking cramp that like to killed me). Well last night I was able to complete the whole session. HELL YEAH! I even ran the whole 90 seconds when it was time, at least 5 times! I was sweating my hiney off, but it felt GOOD! I rewarded myself with dinner with an AMAZING group of friends. And believe it or not we did not go crazy and just eat because it was our 'free' day. I had blackened chicken and wild rice. And a bowl of fruit for dessert! We were ALL rock stars last night. Thanks for my yummy candle A, I promise I won't eat it! Okay I will be back tomorrow and report all the horrible torture that I will endure tonight at the hands of J. I will promise to at least pretend to hate every minute of it. (I think I tiny part of me likes it...but just a TINY part). My, My Some things never change.